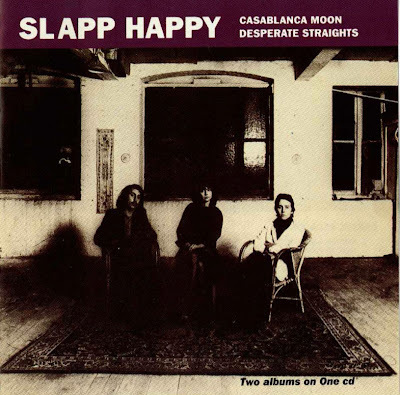 Slapp Happy (also known as Casablanca Moon) is an album by German/British avant-garde pop group Slapp Happy, recorded at Virgin Records' Manor studios in 1974. This album was originally recorded in 1973 in Germany under a working title of Casablanca Moon with Faust as Slapp Happy's backing band, but Polydor Germany rejected it. After moving t London and signing with Virgin Records, Slapp Happy re-recorded it (at Virgin's request) and it was released in 1974 as Slapp Happy. Virgin later re-issued the album as Casablanca Moon. It wasn't until 1980 that Recommended Records released the original recording (with Faust) as Acnalbasac Noom (the title Casablanca Moon reversed). 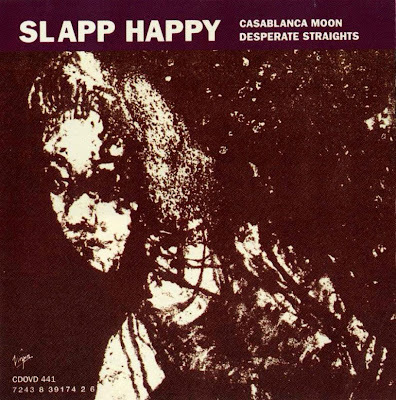 In November 1974, Slapp Happy invited Henry Cow, a politically-oriented avant-garde rock group, to be their band on their next LP for Virgin and the two groups recorded Desperate Straights as "Slapp Happy/Henry Cow". The success of this collaboration surprised everyone, considering how dissimilar the two bands were, and they decided to merge. Desperate Straights was the perfect mixture of avant-garde music and nostalgic pop. The music often had a Berlin Cabaret feel about it with a taste of avant-garde jazz.